IS THIS what others get when they say failed? Is this the one from the B927 thread? If so then it fails to help in some cases - mine fails to update using this. does it do anything to the imei? this is a nice find Gary. thanks for testing it out and posting. did u do the method i said? install this method first? *i mean do this middle thing first them install the update to B926? what about the bootloader thing? is Bootloader still locked at ICS...so if you install ICS and then want to go back you'll still have to root it via that UnlockBootloader.exe? I don't believe that's required with this. The progressbar jumps immediately to about 2/3 and stays there until i pull the battery. Install of B927 doesnt work on my phone too. Im on B926. That is the same as I get. This method is certainly not a fix for all. If you are on B296 you can update to B297 via fastboot, that is how I have done it to see if it works. I'll upload the extracted files later if anyone is interested. I'll upload the extracted files later if anyone is interested. this tool does not work any reason why? Never worked for me either so I had to downgrade then install B927. i now have the tool NOT working for me All i get is a pink bar that gets to 70% then fone reboots - IS THIS what others get when they say failed? I get no text and pink bar but no reboot. same thing on update.app from storage and from power on hold both vol keys. Wanted to see if the new kernel made any difference. oh well, I will wait. Chinese ics is all good for now. Yep that's what I got when I used the middle update.app. It showed just the pink bar with out any notifications. After I downgraded using risky IMEI=0 method I then just installed the 927 update.app and it worked perfect. Also if you check the log in dload folder on your phone it says failed. I've just used this method to downgrade from B927 to B888. After using the Hack method I didn't bother using the huawei tool, I just installed the B927 uppdate.app and it installed fine. So, anyone else having luck with this tool? 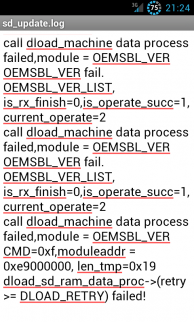 I'm looking to downgrade from B926 (Pauls rom) to B888, but the hack method makes me a little nervous. If you want an ICS rom as in B927 this works a treat doesnt change any thing apart from the system and boot. Just tried this and got the pink line immediately. 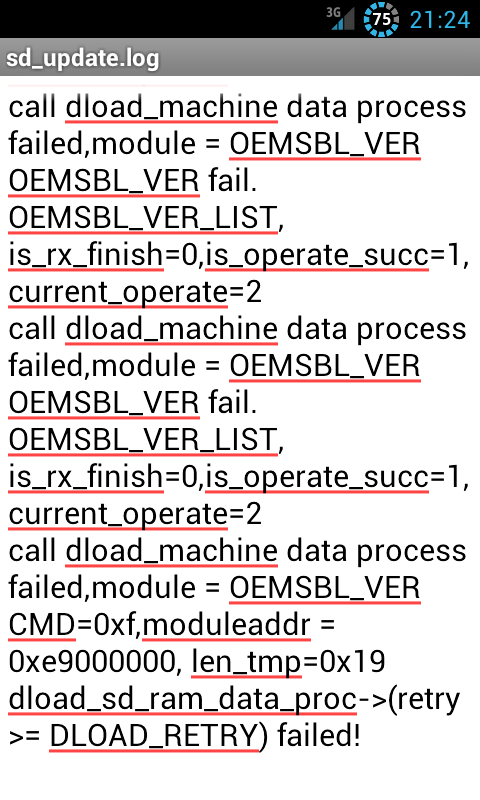 This is the logfile on the sd card but it means nothing to me. Perhaps it makes sense to one of the more experienced members.